Davao City's tourism industry has been enjoying a positive leap especially since President Rodrigo 'Digong' Duterte is from here. Tourists are becoming more interested about Davao and what it has to offer. Aside from restaurants and shopping stores opening here and there, hotels and inns are also on a roll to answer the demand for room and accommodations by travellers and visitors alike. One of these is a quaint little hotel--Aikiko House. 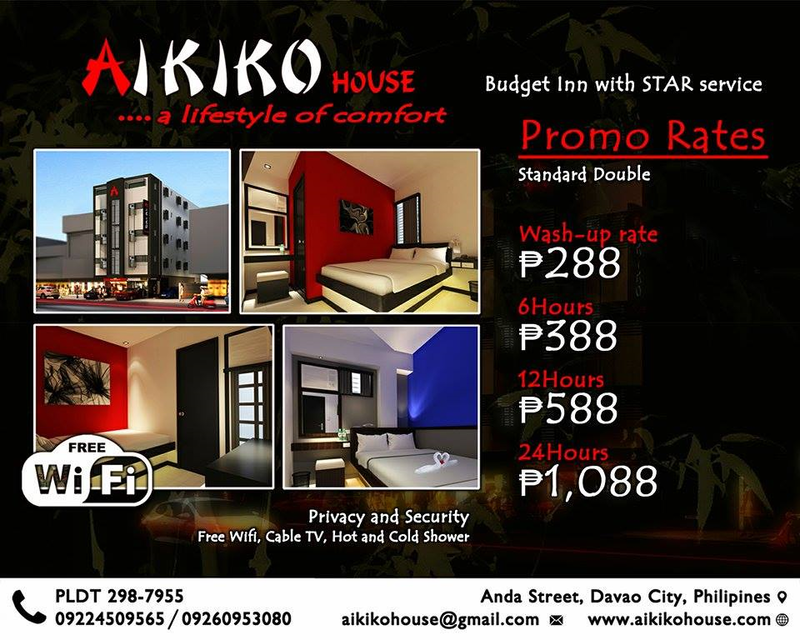 It is a Japanese-inspired inn which just recently opened at the heart of Davao City. Located along Anda St (fronting Cecil's Snack Inn) , it has 30 single/double rooms having minimalist amenities and relaxing atmosphere. This modern mini hotel is perfect for backpackers, businessmen and those who want cozy and clean rooms at affordable rates. It is very accessible to schools, park, churches, establishments, and shopping malls.